Since time began, humans have felt an urge to control others. Unknown to most, complete control was discovered almost 2000 years ago by Dr Fu Manchu of China. Dr Fu took our attraction to circular objects, the color yellow, and almost magnetic focus on zoo primates, to created the ultimate hypnotic image. Too powerful to be shared with the masses, the knowledge was nearly lost over time. We now bring that image to you, on this shirt. 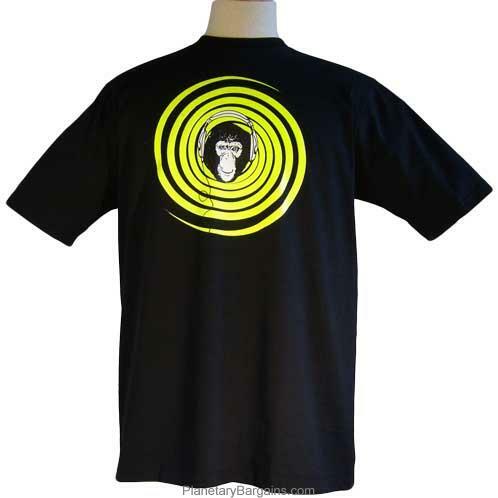 The yellow swirl causes what is known as “The Whirlpool Effect” drawing the viewers eyes directly into the centre of the diagram, a chimpanzee at its heart, reverts viewers to a more primal, less complex, state of mind. Seeing the chimp’s headphones will then cause observers to listen intensely for your commands. Wearing this shirt could make you achieve things impossible to achieved without it.